How cute is this Minnie Mouse Loungefly bag? It reminds me of the Mickey and Minnie bags from Primark recently that I unfortunately missed out on. I wanted to get one for our possible trip to one of the parks later this year but the Primark ones seem to be at least double the price on eBay now so although this Loungefly bag is a tad on the pricey side, it'll probably work out at only a bit more than what I'd have to pay for one of the Primark ones now but hopefully it'd be a lot better quality! These floral Minnie ears are also so pretty - they would be such a cute alternative to the average Minnie ears. They remind me of a cross between Rapunzel and Briar Rose/Sleeping Beauty who are two of my favourite Disney Princesses. I've also had my eye on this Kylo Ren shirt ever since I saw The Force Awakens. I don't usually like villains at all, but there's just something about Kylo Ren? Perhaps it's the perfectly conditioned hair... Who knows? Either way I need this shirt in my life - the fact that you can wear it off the shoulder is a bonus too. Also from The Force Awakens, I've also been keeping an eye on the BB-8 Christmas decoration. I'm hoping it'll be reduced in the sale soon, BB-8 is the cutest little droid ever! Probably the most unnecessary thing on my wishlist is the Pears In A Pod plush from Toy Story 3. I actually almost bought one of these when I was in the Oxford Street Disney Store for my birthday last year but I talked myself out of it because I won't really have much use for it apart from letting it sit with my other pile of soft toys. But four months later, I still want one! I love their little squishy faces, and the fact that you can zip them up or remove the little peas. So adorable! Plus it's only £7.95 so I have a feeling I might end up adding one to my next Disney Store order. Although you can't buy it over here, this Rapunzel frame is still available on eBay and I'm really tempted to get one! I love anything Tangled and we're hopefully heading to at least one of the parks this year so I thought this would be perfect for displaying a favourite photo from our trip. And finally I think I may have to pick up a pair of these Star Wars chopsticks each for the boyfriend and I for Valentine's Day and get us a Chinese takeaway to go with it! The boyfriend is a huge Star Wars fan and a big kid at heart so I'm hoping these would be right up his street. Plus you can get these in a light-up version too! This is such a fun wishlist! 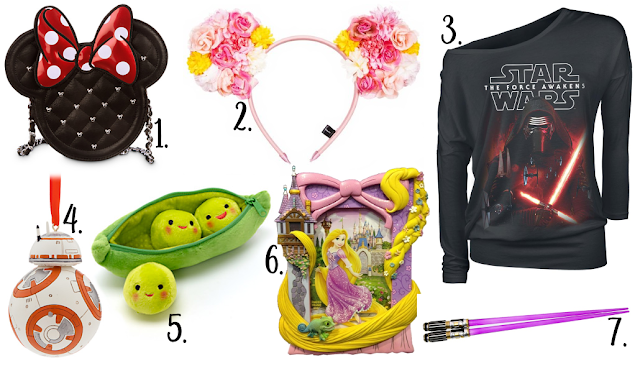 I love the Minnie Mouse bag - I missed out on the Primark version too, which I'm gutted about, so it's good to know there's an alternative option! This would be perfect for a day in the park. The light saber chopsticks with a takeaway is the perfect Valentine's Day idea! What a fun way to celebrate. Oh that Minnie Mouse bag is so cute and so are those Minnie ears! :) I had no idea there are Star Wars chopsticks but they look really fun!